The Powerchair Cape is a totally waterproof cape that has been designed specifically for use with electric wheelchairs. 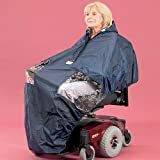 Providing complete head-to-toe waterproof protection, the powerchair cape fits over the user and all the vital parts of the chair including the controls. The cape has been designed with a transparent plastic panel on either side, which allows the powerchairs controls to be seen at all times ensuring the user is able to maintain total, safe control at all times. The cape has a luxury cotton lining that provides the user with warmth and comfort as well as elasticated sides, which helps to ensure a snug fit and keeps unwanted draughts to a minimum, whilst at the same time preventing it from fouling against the wheels. At the back, the cape fits neatly over the rear of the chair so rain cannot entire between the user and the backrest.